Trying a multi control linkage? 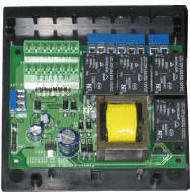 Remaco MPC-850 is a Motor/Power control interface. You can use it to control motorized screen, projector lift, electric curtain or any motor powered equipment through contact closure. Another usage of the MPC-850 is that it could also trigger your motorized screen into rolling down when switched "on" your projector and trigger the screen into rolling up when switched "off" your projector. This can be done by connecting the 12VDC output of your projector to the MPC-850 which makes your AV systems look advance and high-tech.